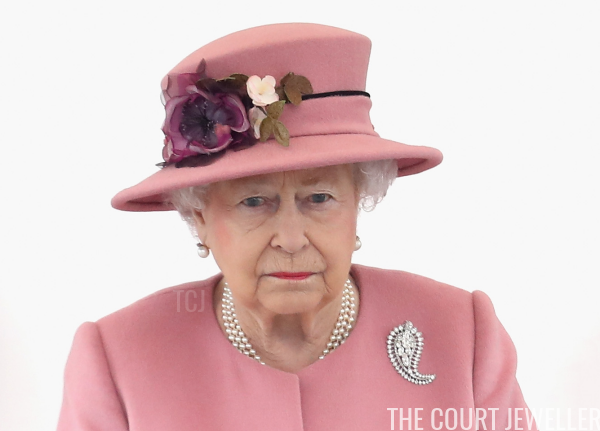 The Queen's personal brooch collection is so vast in part thanks to the jewelry she inherited from her mother, the late Queen Mum. 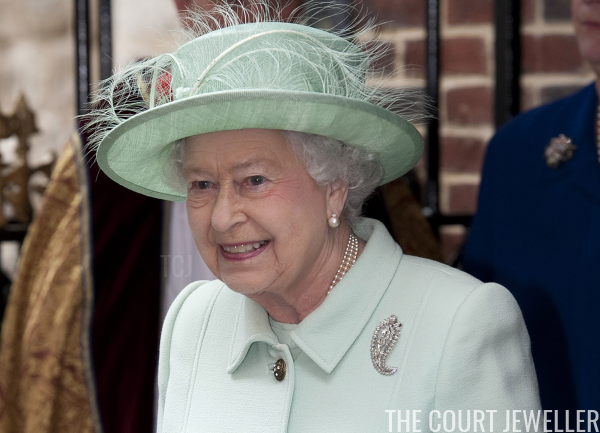 Today's piece, the Queen Mother's Palm Leaf Brooch, has been a favorite of both royal women. 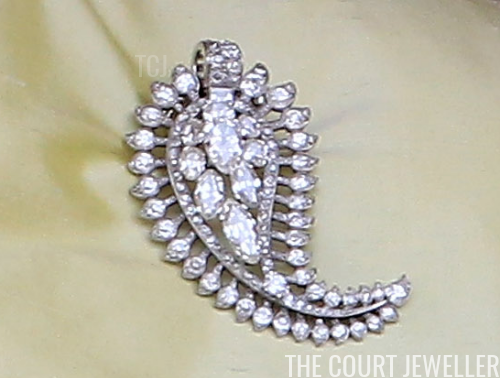 The Queen Mother commissioned Cartier to make the Palm Leaf brooch for her in 1938. The jewelers used loose diamonds that were already in her collection to construct the piece, which jewel lovers have noted also shares a major resemblance to a paisley motif. Indeed, one of the French translations for the word paisley is "palme." The design takes its English name from the Scottish town of Paisley, where weavers produced shawls featuring the design in the nineteenth century. But the design pattern is much older. The pattern woven into the Scottish shawls was based on designs found on textiles imported by the East India Company from Asia. These textiles often featured floral patterns with curved teardrop shaped designs, originally produced in Persia, called "boteh." The pattern was used extensively in artwork and art objects from India, including the palm-shaped sarpech ornaments worn by Indian princes on their turbans. The boteh patterns were replicated by the weavers in Paisley, and as the shawls they produced became more and more popular, the pattern began to be generically called "paisley" by English speakers. The incorporation of a paisley pattern in a brooch was an especially appropriate choice for the Queen Mother, who came from a Scottish aristocratic family. She wore the brooch for the rest of her life. 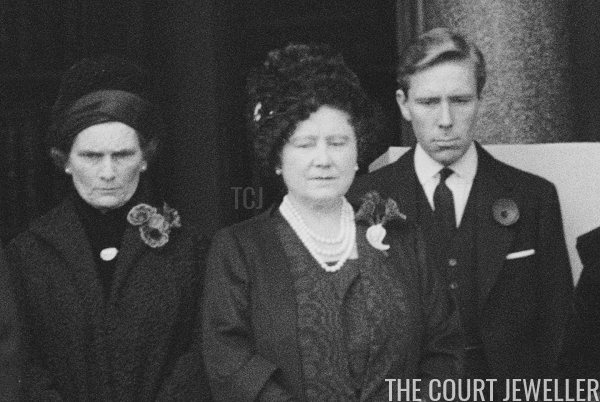 One memorable appearance came in February 1952, when she wore the brooch at King's Cross Station as the body of her husband, King George VI, arrived from Sandringham. 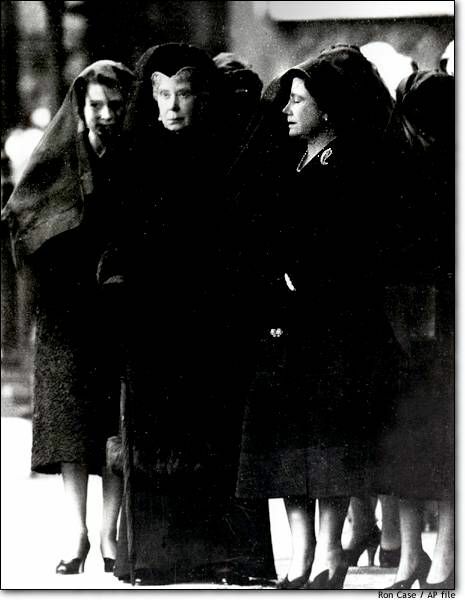 The occasion was captured in the famous "Three Queens in Mourning" photograph. 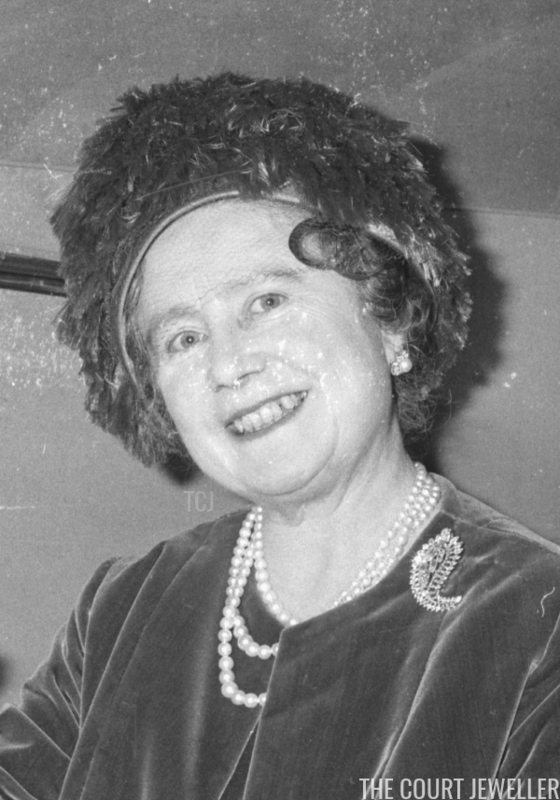 She was also captured wearing the brooch in February 1964, when she made a reassuringly glamorous appearance as she was discharged from the hospital after an operation. Decades later, the Palm Leaf Brooch was still one of her favorites. Only a few months before her hundredth birthday, the Queen Mother wore the brooch at Cheltenham, where she presented trophies after the Queen Mother Champion Chase. 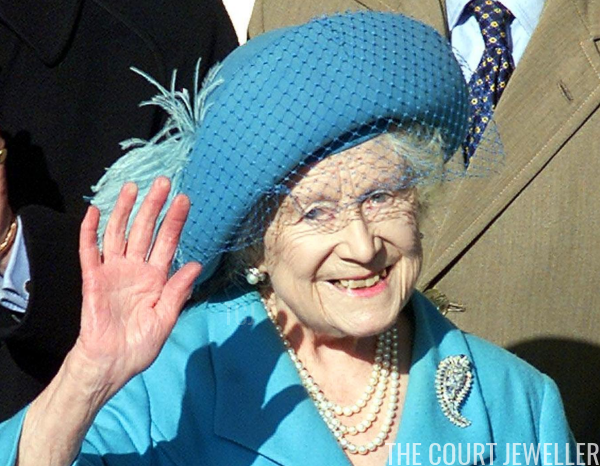 When the Queen Mother died in 2002, her jewelry was inherited by her daughter, the Queen. She has since divided up the collection, offering several pieces to other members of the royal family (especially the Duchess of Cornwall) as long-term loans. 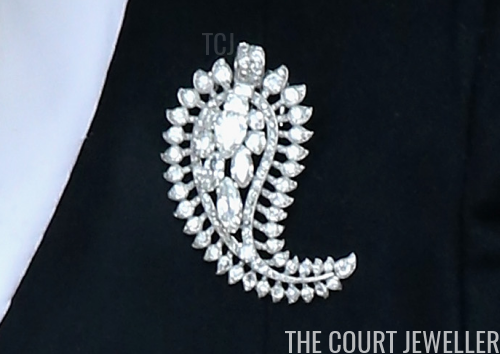 But she has kept the Palm Leaf Brooch for her own personal use, and today it is one of her most frequently worn brooches. 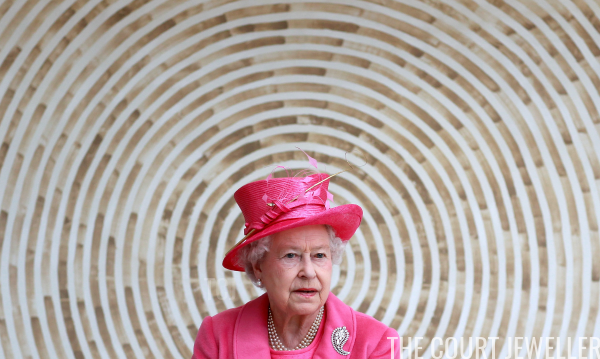 Above, she wears the brooch in November 2012 for the dedication of the Diamond Jubilee Window at The Queen's Chapel of the Savoy.